"Until we meet again, old friend." After the Friday night football game, after all Saturday at Castle Manor, and after Saturday night dancing at the American Legion, nineteen from the Class of '68 (and four guests) joined for dinner at Main St. Grille in downtown Mishawaka. We had the place to ourselves. The meal began with grace, offered by Don Plummer. A total of 86 from MHS '68 had joined in one thing or another during the weekend, and a few more had helped to make the reunion happen but had been unable to be present during the weekend. It was time to say, "Until we meet again, old friend, goodbye." 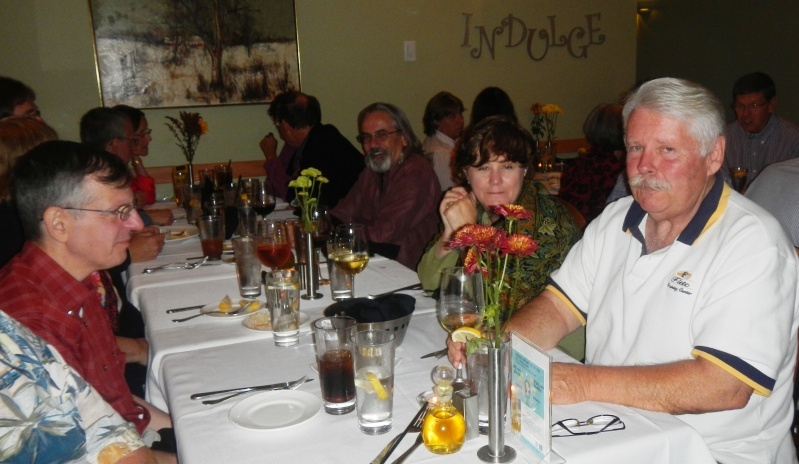 Above, on the side of the table with faces showing, beginning next to the wall: David Hamman, Don Plummer, Suzy Collins, Pat Bellovich (Mrs. Mike), and Mike Bellovich. 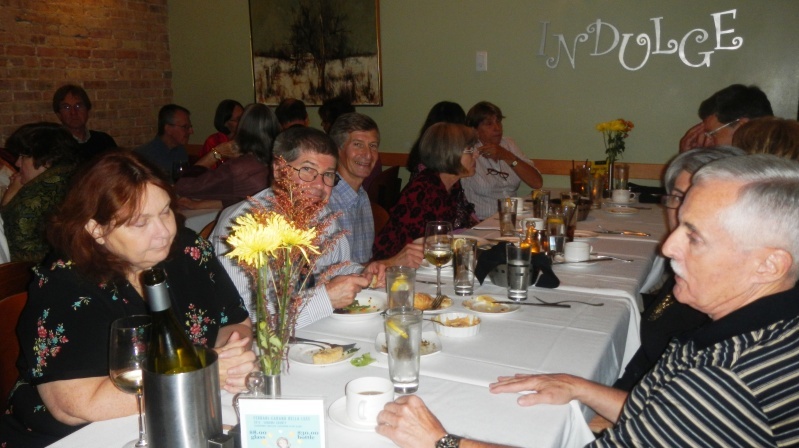 Above, beginning in the lower left corner and going down that side of the table: Jeanette Shown (Mrs. Jim), Jim Shown, Tom Grau, Mary Rhoade, the top of Carol Ann Nix' head, and Pat McGee. 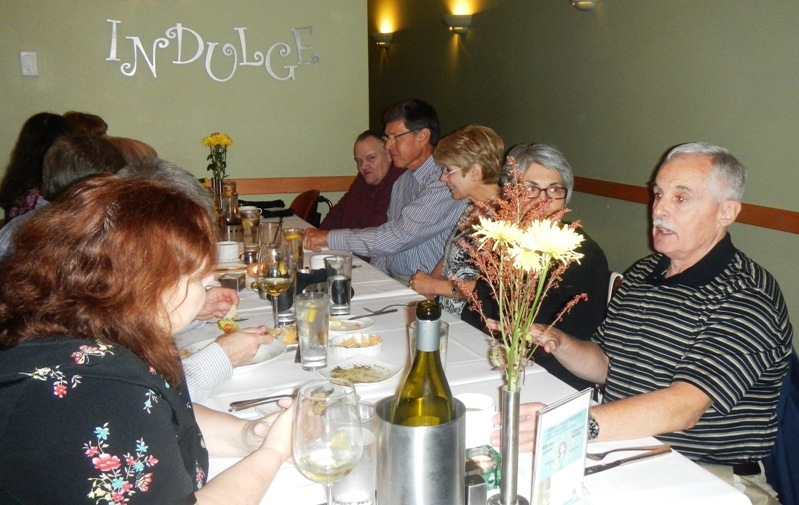 Above, beginning on the far right and going left down that side of the table towards the wall: Terry DeMaegd, Maggie DeMaegd (Mrs. Terry), Patrick Long, Pete Dexter with head turned (MHS '67), and only the barest bit of Donna Games visible. 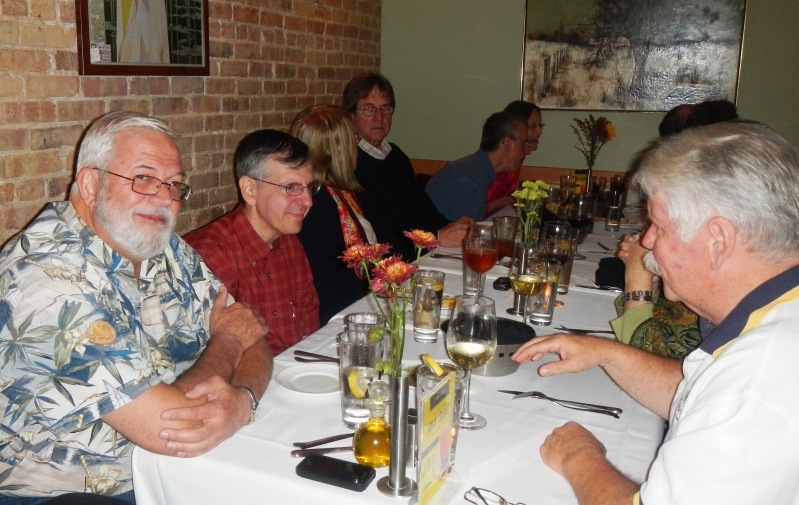 Above, beginning on the left and going down that side of the table towards the wall: Dan Nicolini, Cosimo Natali, Alice Marie Beard (back of head), Bill Groth, Mike Natali, and Mary Jane Dexter (face barely visible). Pam Craig took the photos, which explains why she is not in the photos. Above, when it was all over, four high-school friends bid adieu. 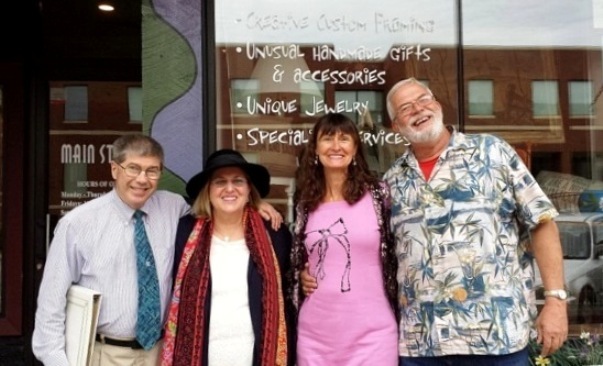 Jim Shown, Alice Marie Beard, Carol Ann Nix, Dan Nicolini. In high school, Jim, Alice, and Dan put out the weekly newspaper: Jim sold advertising to fund the paper; Alice wrote copy; Dan took the pictures. At the end of high school, Alice, Carol, and Dan were three of the ten who planned the graduation events for the MHS Class of 1968. In the 45 years since, Jim went to war when he was over 50, Alice raised children until she was 50, and Carol and Dan both prosecuted criminals until they got tired of it. Like every other "class of," the Class of '68 learned that life gets complicated when you get past 18. In the words of the Statler Brothers: "We all thought that we'd change the world with our great words and deeds, or maybe we just thought the world would change to fit our needs. ... But living life from day to day is never like it seems. Things get complicated when you get past eighteen." Until we meet again, old friends, goodbye.